You will demonstrate an organized and effective writing style that allows readers to navigate easily through the text. You will be able to interpret, analyze and evaluate fiction and non-fiction texts. You will engage with perseverance in a long term research writing process, gathering and responding to effective evidence, formulating and organizing an effective thesis, and drafting and revising towards a finished product. expository and literary response compositions as well as documentation of the research process. This course is designed to prepare students to take the AP English Language & Comp. Exam. Students may receive college credit through successful completion of the AP English Exam. Language and Composition students are provided a unique opportunity as they will read a wide variety of prose that span a range of interests between the disciplines of art and science with an emphasis in American writings. These readings provide models for a variety of writing opportunities in rhetoric and expository writing. The theme of “the American Dream” allows reading, writing, and discussions to include a wide variety of conflicts that allow the course to focus on cultural, social, and philosophical, issues that have created the American world and that confront our diverse populations in the twenty-first century. the nature of knowledge, truth, reality, and individualism. discussion. The goal of the course is to help you become an active, discerning reader, and a thoughtful, perceptive writer. PLEASE NOTE: Assigned literary readings will deal with some mature themes, and as it is an elective course, no alternate assignments will be offered. of the research process. 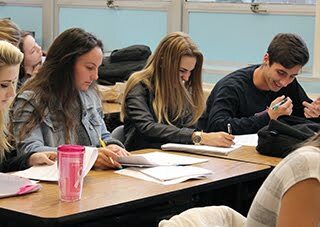 Participation in this course also prepares students for the English portion of the California High School Exit Exam (CAHSEE), which is required to earn a diploma. This required course is focused on the theme of “The American Dream” and involves close reading of American literature and nonfiction, with an emphasis on seminal U.S. primary source documents. Literary readings are drawn from poetry, short stories, novels, and plays. Composition assignments will focus on both literary and rhetorical response (in preparation for the EAP), and will culminate in a long-term research project. This course is intended as a bridge to English 12 and a first step toward the critical thinking required beyond high school. Introduction to Composition (Sierra College) Writing, reading and critical thinking skills necessary for successful completion of a four-year college program. Includes reading, discussion and analysis of selected non-fiction texts. Writing assignments teach students to summarize, explain, analyse, synthesize and organize information in research, MLS documentation and completion of a fully-documented paper using multiple sources. Critical Thinking and Writing About Literature (Sierra College) Develops critical thinking, reading and writing skills applicable to the analysis of prose, poetry, drama and criticism from diverse cultural sources and perspectives. Emphasis on the techniques and principles of effective written argument. formal writing and some research. basic requirements, but will move at a more accelerated rate and include supplemental texts and materials. Students earn Honors grade bump. human learning and ideas are connected. This course is designed to prepare students to take the AP English Literature & Composition Exam. Students may receive college credit through successful completion of the AP English Exam. literature and desire a deeper understanding of the artistry behind the written word. computer design? Are you interested in ending every school day among really fun and friendly people? Yearbook just may be the class for you - where all your hard work and effort and service to the student body will result, not merely in a grade, but a professionally printed and produced book containing a year’s worth of memories. Yearbook is a two-term, year-long class. This is an elective course for students who are continuing yearbook production for the second year. Students must attend both fall and spring terms.